Many traditional arts and artisans' skills in Laos have either disappeared completely or are on the verge of disappearing as older artists pass away. The few skills that have survived, especially those related to silk production and weaving, and wood carving, are driven by commercial interests. These losses are acute in Luang Prabang which traditionally had been a center for creative arts. 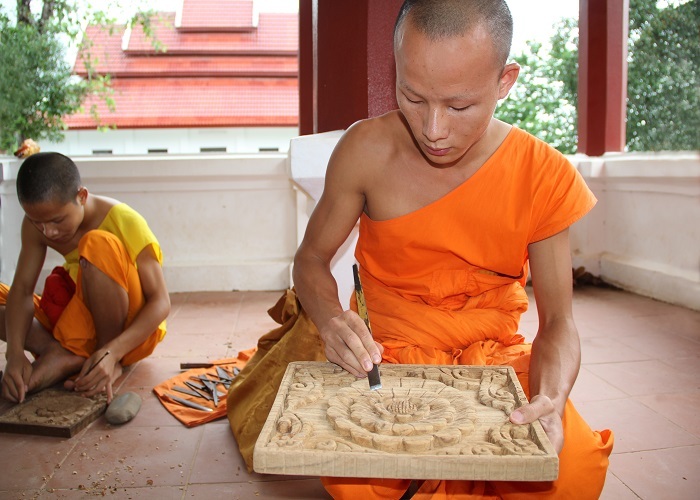 Recognizing that this loss represents a serious challenge to the future of Lao culture, the Buddhist Sangha has initiated plans to construct a Vocational School of Arts at the Buddhist Academy. 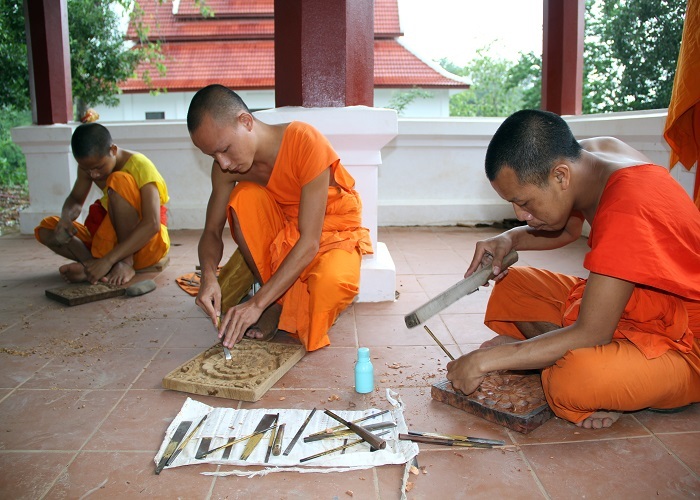 Just a few of the disciplines that are intended for inclusion in the curriculum are: bronze casting; high glaze ceramic production; stencil cutting and application; production and preservation of palm-leaf manuscripts; production of traditional musical instruments; the creation of natural based dyes and paints; mural painting and gold leaf application. 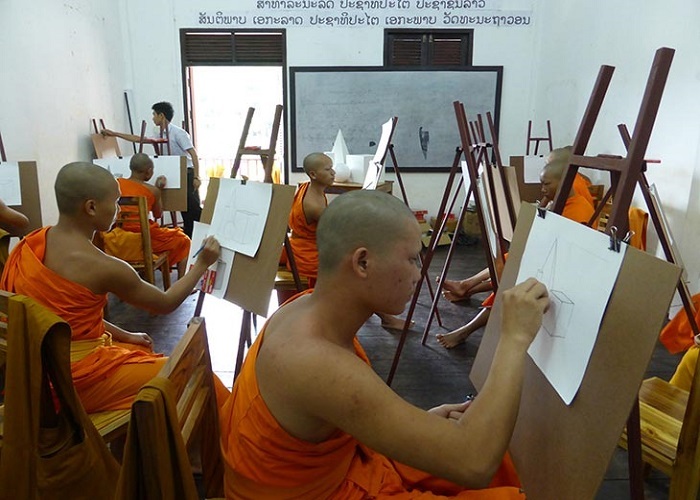 The vision of the Arts School is sustained by the knowledge that many of the young novice students at the Buddhist Secondary school will, upon graduation, leave the monastic order and seek employment in civilian life. Thus the Arts School offers two significant promises; that of reviving the artistic skills themselves, and that of providing gainful employment (and the related poverty reduction) to many of the graduates. In December of 2015 a one-month workshop was held at the Academy to gauge the potential interest of the students in the Arts, and the availability of teachers and qualified instructors. The workshop was a resounding success and gives the Sangha, and the Buddhist Heritage Project, impetus to continue with the Arts School. The workshop also underscored the desire of many of the students to advance their creative thinking capacities, in Arts disciplines and beyond. 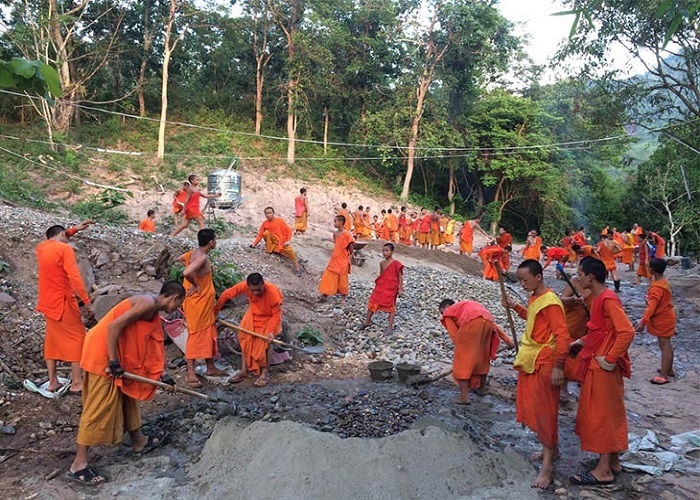 Construction has begun on The Vocational School of Arts in mid-2017, with the Monks and Novices building access roads, drainage and retaining walls with help from the local community. Construction of the first building is underway, with planned completion and operation by the opening of the 2018 school year in September 2018. 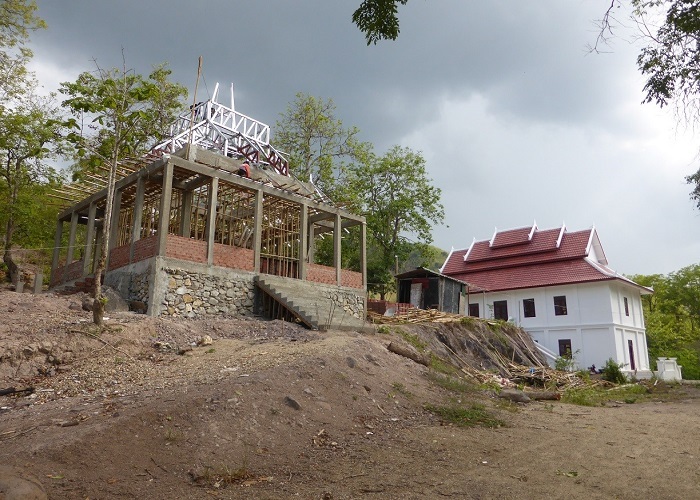 The photos below give a glimpse of the vision and progress encompassing the Buddhist Vocational School of the Arts. 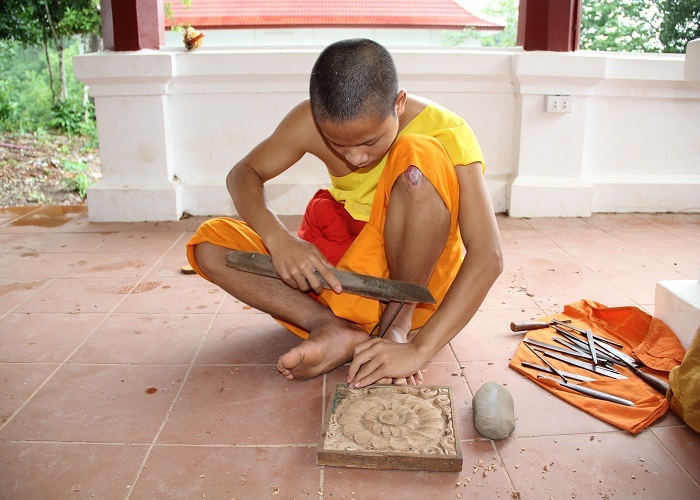 Please also follow this link to our Social Enterprise page for more information on the Arts in Luang Prabang. A workshop held several years ago made clear the interest in the Arts School, the pool of potential talent among the students, and their desire to expand their creative thinking. A beautifully detailed scale model of the Principal teaching buildings of the Arts School, created by a young Master Craftsman, reflecting one of the goals of the teaching at the School. To celebrate the end of Buddhist Lent, young Novices display their innate creative talents by constructing stars to decorate the Temples of Luang Prabang. Preliminary Architectural drawings by Architect Laurent Rampon of the first Arts School building now under construction at the site. No strangers to hard work, the young Monks and Novices at the Buddhist Academy graphically display their willingness to join in the construction works. And in typical Lao fashion, are willing to use any and all equipment available to get the job done! Here the Novices tackle the huge task of creating effective and efficient drainage and retaining walls prior to the construction of buildings at the Arts School. And the professionally completed results of their labors in constructing the drains can be seen clearly. Here they begin the huge job or building the road and re-shaping the hillside to create the spaces where the School buildings will rise up. The cleared, level and prepared hillside, ready for construction of the first Arts School classroom building. To celebrate Lao New Year, and as a testament to the involvement of the local community, students and lay people build traditional, decorated sand Stupas, knowing they will be washed away when the first rains come, in reflection of the impermanence of the Universe. 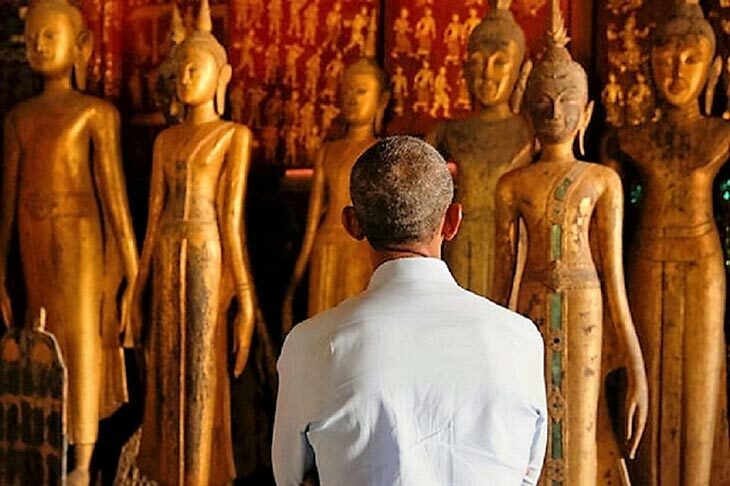 The ethereal imagery of Luang Prabang Buddhism, and the artistic creation it evokes, draw visitors from all over the world. Join them, and see for yourselves!